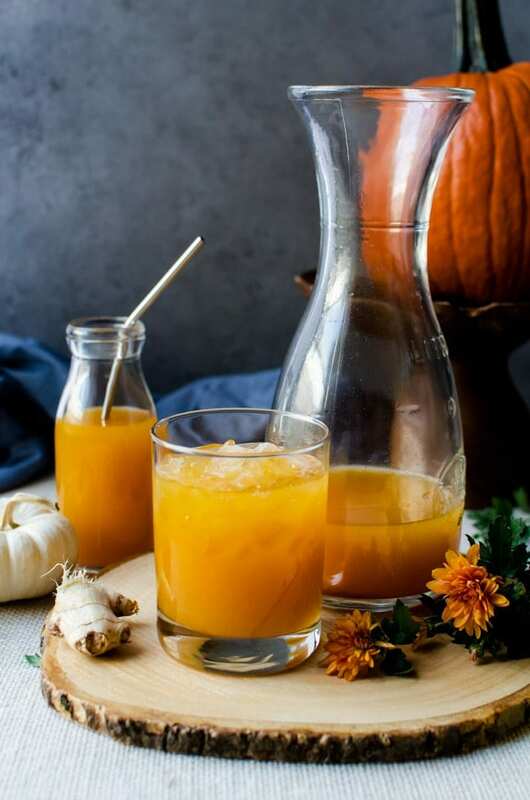 Sweet pumpkin, spicy ginger, and warming spices come together to create an irresistible glass of pumpkin shrubs. This deceptively simple drink is like fall in a glass; it’s perfect on its own or mixed with your favorite spirit. Today is one of the best days in autumn besides Halloween and Thanksgiving. Today is #virtualpumpkinparty day! This is the day that food bloggers from everywhere share a tasty pumpkin recipe for everyone to enjoy! This is the second year it’s been around and I’ve been waiting for it since the first one ended last year. And in case you were wondering, yes, I did realize when I made my short-lived pumpkin ban that I would need to make a pumpkin recipe for this. But since I knew I was joining in again before I made that ban, I considered it an exception to the rule. Not that it matter anymore that I broke my ban making pumpkin brioche and brown butter pumpkin chocolate chip cookies. I have an obsession with shrubs. They are a drinking vinegar with a very long history in the world because of its health benefits. I started making my own at about the same time I started making my own kombucha. 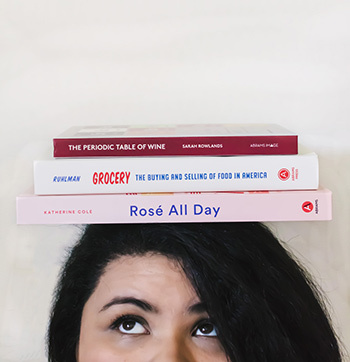 During the summer I had plans of sharing a few shrub recipes with you, but after being sick and moving, it completely slipped my mind. It wasn’t until I started brainstorming unique recipes to share for the virtual pumpkin party that I came up with the idea of making pumpkin shrubs. My original idea was making pumpkin fries, which I might still make one day. I’ve had that idea in my head and written down in my notebook since last year, so who knows when that’ll actually happen. I’ve never had anything like pumpkin shrubs before. 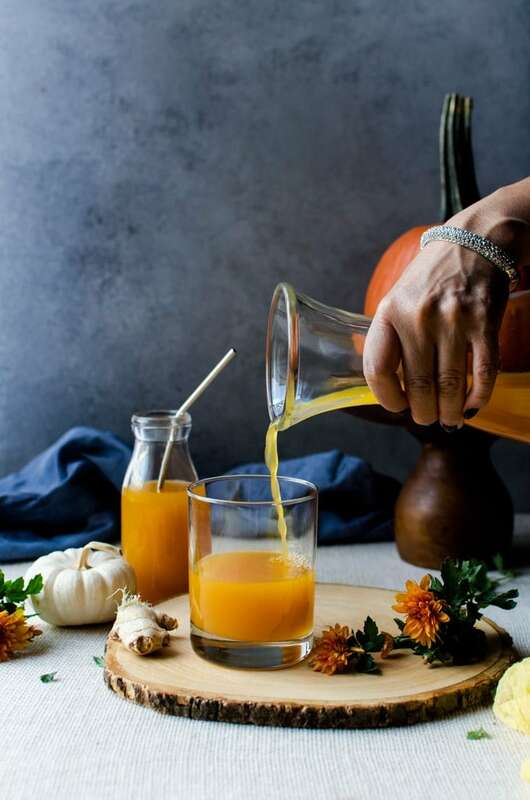 If you’ve never felt like you really could pinpoint what the actual flavor of pumpkin is, this drink will show you just that. Sure, you can taste the ginger and spices and vinegar in the shrubs, but the taste of the pumpkin is unmistakable. I used my signature blend of pumpkin spices: ginger, cinnamon, and cardamom. They are my favorite and work especially well here in the pumpkin shrubs. 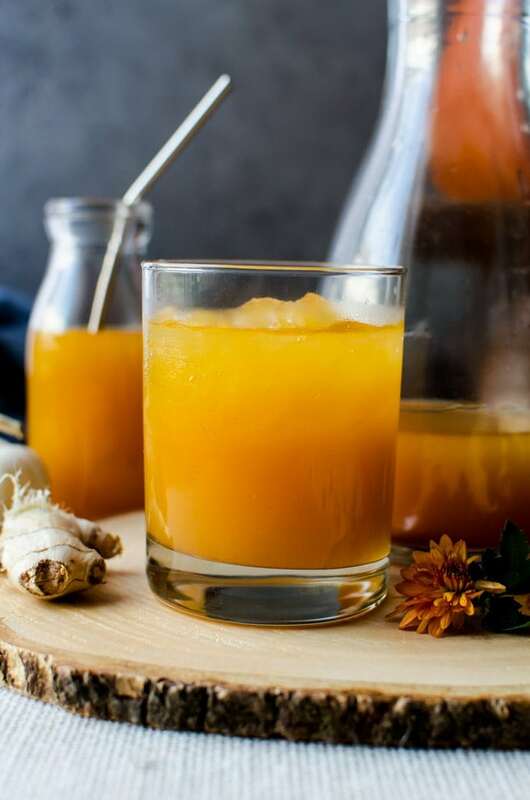 Fresh ginger gives the shrubs a wonderful spiciness, while the cinnamon and cardamom gives it this really amazing warmth. Together, it is like pure fall in a glass. A sip of pumpkin shrubs will have you dancing in a pile of golden yellow and ruby red leaves in your infinity scarf and boots. It’s perfect to drink on its own, but you can also add a touch of sparkling water to dilute it a bit since it is a thicker drink. I personally love to use it in a cocktail. Personally, I love adding bourbon or even vodka. I have this maple infused bourbon in the house and it is really good with the pumpkin shrubs. 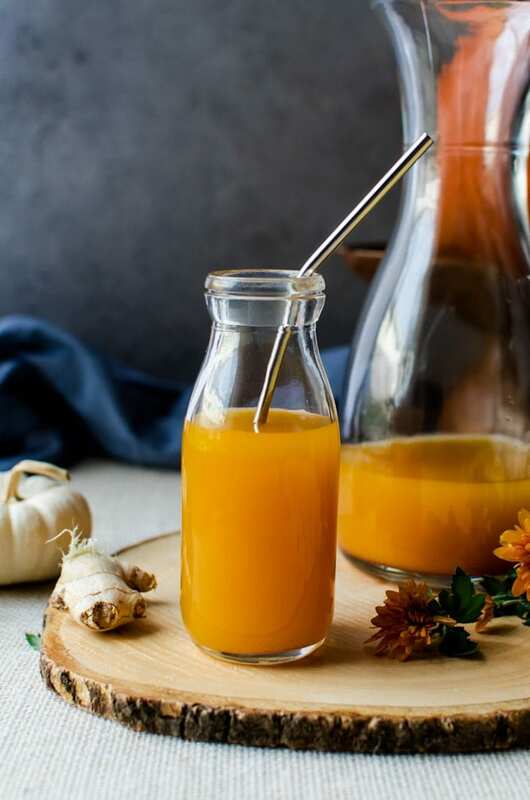 The best part about pumpkin shrubs is that it is a very simple process to make. 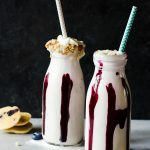 It is simply a matter of mixing the ingredients together, waiting, and then straining out the juice. 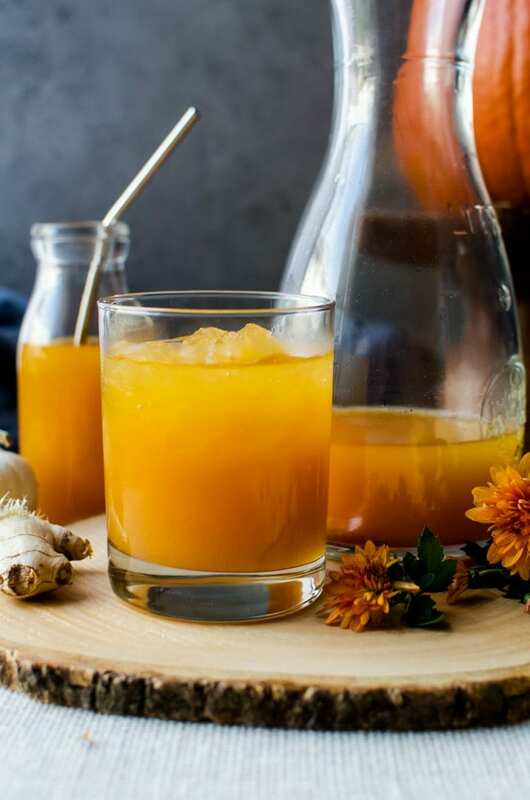 Deliciously simple pumpkin shrubs is like drinking fall in a glass! In a large bowl, mix together all the ingredients. Cover tightly and store in the refrigerator for 48 hours. 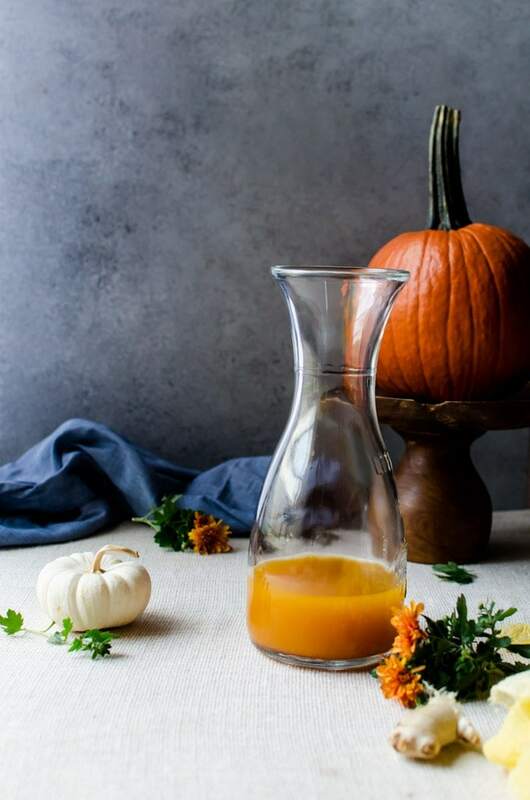 Strain the juice from the pumpkin puree using a cheesecloth. For best results, strain the puree two or three times to get as much of the liquid from it. Pass the strained juice through the cheesecloth to ensure there are no bits of puree in the juice. Store the juice in an air tight container. *If you are using fresh pumpkin, you will need to use a small pumpkin that is at least 3lbs in weight to get the amount you need. Gut and cut the pumpkin in half, then roast at 350 for about an hour. Scoop out the pumpkin inside and puree. 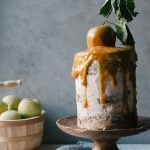 You can find everyone’s tasty pumpkin recipes on Sara @ Cake Over Steak‘s and Aimee @ Twigg Studio‘s blogs! GIRL! This is brilliant. I’ve only made shrubs with berries and never in a million years would have thought about using pumpkin. Super cool. And the color is FAB. Oh and you know I’m definitely adding bourbon! I’ve only had it with berries too, but then I heard someone talking about tomato and cucumber shrubs, then I realized that you can really make shrubs with anything, so why not pumpkin? I tried it with a few different types of bourbon and rye, definitely see if you can use some maple bourbon because it was amazing together! i love the color of this!! and i’ve never had a shrub before, but kombucha (someone called it buch and said it like BOOCH the other day and it sounded very off to me even though it’s not that bizarre) is so refreshing that i bet this would be amazing. I totally call kombucha “booch” sometimes when I wanna feel like I am one of the cool kids haha. You will love shrubs, especially if you love kombucha! It’s sweeter and doesn’t have any carbonation, but it still has that bite to it. Bring over some pumpkin hummus and it’s a deal!